Churches and ministries are working hard to reach out to a new generation. An inviting and dynamic website is an absolutely essential part of building an enthusiastic community. 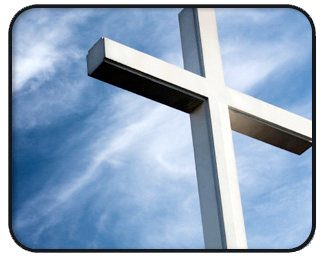 Our mission is to provide the faith community with the latest technology that makes your site engaging and easy to maintain. Connected Word provides you with an amazing array of design styles as a starting point. Once you've chosen the one that fits in with the vision of your church, a real designer will work with you to customize it, and make it your own. We assemble your logo, name and color choices into the design and send you a variety of choices for your feedback and approval. 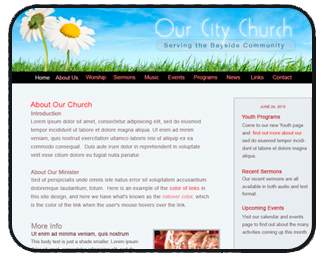 Once you've approved your design, we receive from you images and some basic information about your church, and then we work that material into your site. When you first go to look at your new website, you see a site already brimming with complete starter content, with the information you provided fully integrated into the pages. Among the many pages that come standard), we've included a great-looking flash photo gallery, a complete "Join Us" section to help you invite new people, an audio player that can play recent sermons, a location page using google maps, and many other useful pages, all set up for you. You can of course hide any of these pages easily, but they're available when you're ready for them. As full and abundant as your starter content is, you will of course want to expand upon it and make it fully your own. Everything is done with ease. Easy. Right from your browser, login to your site and edit your content with a few clicks. You also have an easy management area where you can add new pages and upload pictures. If you want to really unleash the power of online connectivity, then let your website become a true hub for your community. With Community Builder a powerful suite of features will come already fully set up for you that will make connecting to your community effortless. 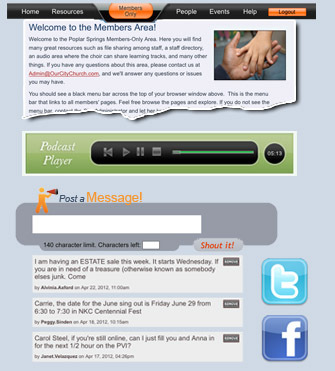 A full Members Only area (a complete site within-a-site requiring login), Blogs for your leadership, an intuitive and easy-to-manage Podcast system (with room on your site for 50 hours of audio), a message board, and social networking tools, make your site a real hub for your community. 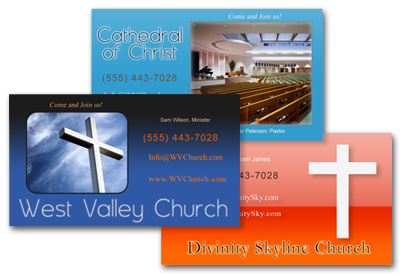 If your church wants a consistent look or theme that runs through your marketing material, you may want to consider getting business cards with Connected Word as well. All Connected Word websites have matching business card designs available. We will send you proofs of the business cards for your feedback and approval before sending the design to the printer. Once the cards have been printed, they will be in the mail to you within 3 business days. Future reprints are equally quick. Your site also comes standard with full Email support, where you can easily add, manage, and delete unlimited numbers of email addresses at will. Forwarding options, webmail (where you can login remotely to view your email in a browser), Gmail support, as well as Outlook and all Email client support is there for you. The Guestbook is a fun way for your visitors to say hi, and for you to build a community. 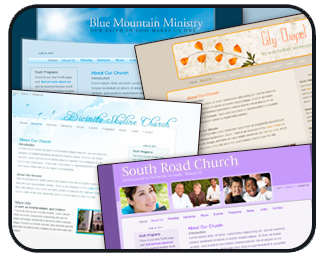 We provide a Search Engine Optimization service to help your church get better search engine page rankings. 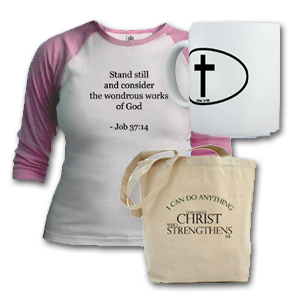 Many churches are having success raising additional funds by selling a variety of products featuring their logo or church name. Using a service called CafePress, we can set up an online store for you, upload your images and place them on your products. And the best part: we build the product page right into your Connected Word website. You can set the CafePress prices to any level you want. 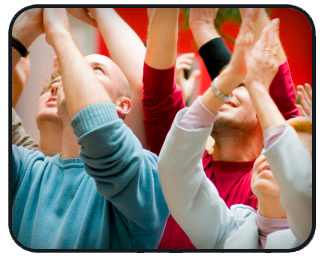 It's a brilliant fundraiser, and lets your congregation show its support. In addition to a wealth of informative video demonstrations and other online help pages, all your additional questions are quickly answered by our friendly and knowledgeable staff. We at Connected Word are committed to making your website experience as joyful and easy as possible. Connected Word websites come with free design and free setup, and a $29.99 per month hosting fee. There is a one-time setup fee for Community Builder, Business Cards, and the CafePress Store, and these come with a discount if ordered at the time you sign up for a website. Click on to the next page for more specific pricing information.